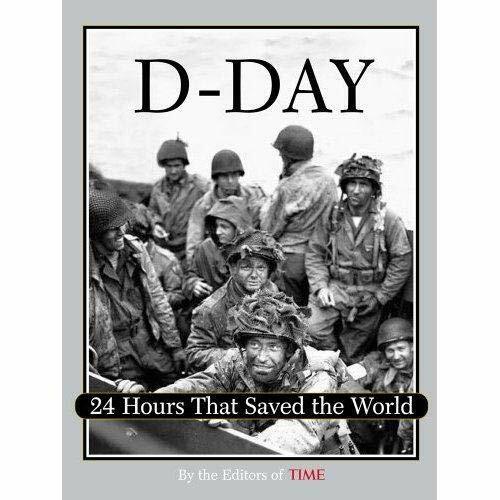 Time's D-Day: 24 Hours That Saved the World is a collection of photographs accompanied by magazine-style writing. The book's 154 pages contains memorable parts such as photographs by Robert Capa, verbatim text from a 1944 issue of Time magazine, and a photograph of veteran Bob Williams walking across the very same French fields he had walked across fifty years ago. The copy I am reviewing is the 60th Anniversary Tribute edition of the book printed in 2004. The major chapters of the book are seperated according to each hour of the twenty-four hours boasted by the editors, and each hour was dedicated to photographs and text regarding a different group of men or events. For example, the first major chapter is dedicated to the paratroopers, describing their training, their experiences, their equipment, and so on. Sidebar story of Paratroopers Ralph Manley adds a degree of personal touch in an invasion that was made possible by thousands upon thousands of personnel. All-in-all this is an excellent book. Although the text is not very much in depth on any topic, it contains a stunning collection of photographs and some detailed maps on topics related to the Normandy landings. The 1969 photo of General Omar Bradley standing on Omaha beach, in my personal opinion, alone is worth the mere $10.99 that it costs to purchase the book.